This challenge was all about a human-computer interface, and once again the entries have blown us out of the water. These are the best projects for HCI we’ve ever seen, but what does that mean? The most obvious example of a human computer interface is, by far, the lowly keyboard. Over the past few years, the mechanical keyboard community has built upon the works of firmware geniuses and created a universe of unique keyboards in every shape and size imaginable. 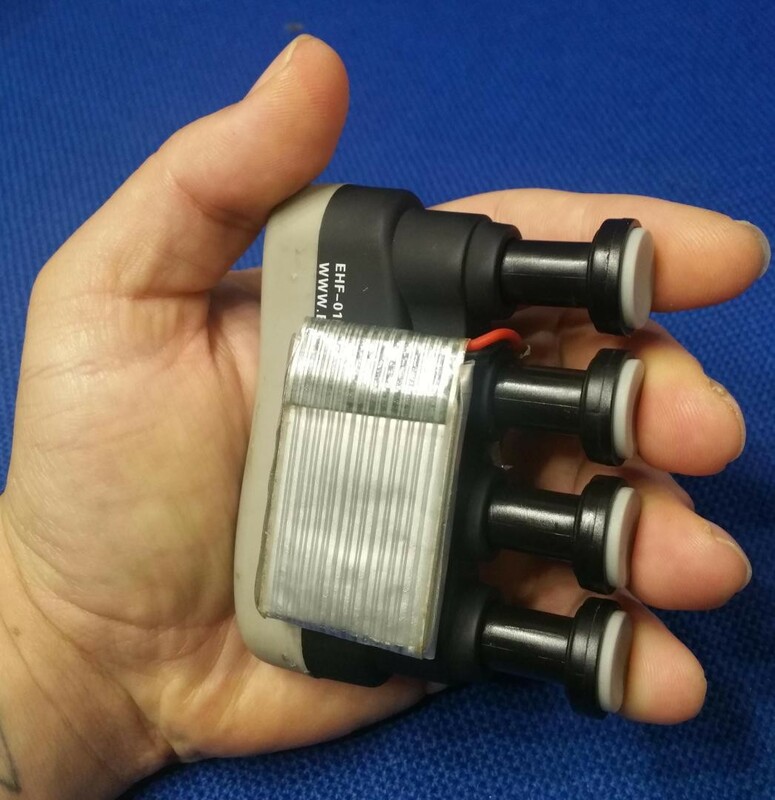 But these Hackaday Prize finalists go one step further. The Ergonomic Handheld Mouse / Keyboard Alternative from [Shervin Emami] is an all-in-one solution for your keyboarding and cursor moving needs. It’s a Bluetooth keyboard and mouse, but this one’s a chording keyboard built out of a $5 finger strengthening device originally designed for guitarists and people with RSI. By adding some buttons, a gyroscope, and an accelerometer, [Shervin] turned this $5 device into a piece of hardware that is priceless. But the Human Computer Interface Challenge isn’t all about keyboards. There’s plenty of examples, and one of the greatest is [Bruno Laurencich]’s Motion Capture system that you can build yourself. This build began with a desire to make a digital performance with a dancer on stage. This obviously requires a motion capture suit, but they’re expensive. None were available at a reasonable price. That didn’t matter to [Bruno], and where there’s a will, there’s a way. 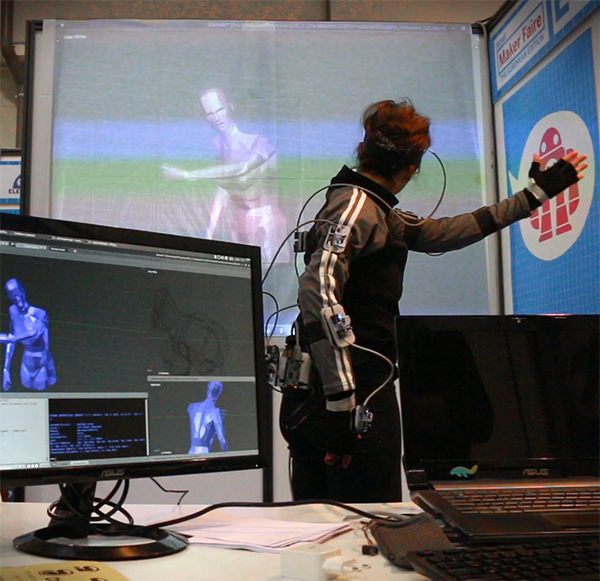 This motion capture outfit is built out of several MEMS IMU devices, all strung together to a master control unit. With a few sensor fusion algorithms, the results are acceptable. This means [Bruno] is able to capture the motion of the human body, and render these captures in a Lawnmower Man-like simulation. It’s just about the coolest entry into the Human Computer Interface Challenge, and there are almost two dozen more like it. The Hackaday Prize isn’t over, though. The Musical Instrument Challenge has just begun. It’s our competition to build the equal of the synthesizer, the electric guitar, or the theremin. If you’ve got the skills to build a machine that makes bleep bloops, we want to see it. We’re really looking forward to the results of this competition, it’s sure to be amazing. Twenty entries from this challenge will each win $1,000 and a shot at the grand prize. There’s still time to win your place among the hardware greats, so start your Hackaday Prize entry now. The Digital White cane is super cool, but it says 2017 hackaday submission on their profile project picture, maybe this is an error? There was an error, good catch! Also Digital white cane appears to be a finalist for the same project last year, it doesnt show that it was submitted for 2018 hackaday, can someone check that? Correct it if needed? Hey Josh, thanks for catching this! There was an error and we’ve updated the list to reflect the proper results. Thanks for having your eye out! Hi, There are only 19 entries listed. Hi, Can I know why projects like NeuroLS, Minder and NeuroCuddl were just down right eliminated? I found them to be the most deserving and most creative. Half the projects here lack enough build logs or documentation to win. This rounds result was a bit unfair. Nice projects! However, I’m surprised that https://hackaday.io/project/114107-mega-powerful-flashy-beeper-module and https://hackaday.io/project/110479-bodihub made it to the finals… They lack the required 4 build logs or 4 build instructions to qualify? Or are these only required for the finals? Obviously you can mix and match eg 2 logs + 2 instructions. The BodiHub actually has nine previous logs, totalling 12. It says it’s a continuing extension from the A Wearable, IoT+ANN Dev Board for Body Sensing, and links to it in the first paragraph. The creator apparently wasn’t too keen on just cutting and pasting all nine of the previous build logs to the submission. Hey Mark! These projects that were accepted with under 4 logs are my fault and are being rectified. As community leader, I do everything I can to give Hackaday community members as much support as possible. This includes looking for as many ways as possible to prevent active members from being disqualified for technicalities when it is clear that the documentation and the spirit of the Prize are there. In this instance, I overstepped my bounds by interpreting build instructions and logs from previous pages of projects as acceptable logs. Our dedicated legal people have pointed out this incongruence with the official rules and the importance of sticking to them closely. Sorry for my error! I’m pretty disappointed with the outcome of the Human Computer Interface Challenge. Why are there rules if they don’t apply anyway? Some of the projects that have won don’t have enough build logs. On the other hand there are much more impressive projects which comply with the rules didn’t win, too bad. Hey Jan! The projects that were accepted with under 4 logs are my fault and are being rectified. As community leader, I do everything I can to give Hackaday community members as much support as possible. This includes looking for as many ways as possible to prevent active members from being disqualified for technicalities when it is clear that the documentation and the spirit of the Prize are there. In this instance, I overstepped my bounds by interpreting build instructions and logs from previous pages of projects as acceptable logs. Our dedicated legal people have pointed out this incongruence with the official rules and the importance of sticking to them closely. Sorry for my error! For those who are curious, this is how the judging works! Every project is both ranked & rated 1-10 by at least 2 technical judges, and every judge judges less than 80 projects total. The total number of judges varies based on the number of entries. These ranks & ratings are averaged and the highest 20 averages win. I tried to open all prize finalist’s project pages simultaneously in new tabs. The first 9 loaded, the rest didn’t. I tried refreshing a loaded tab and it couldn’t be loaded anymore. It seems like I’ve been flood-banned from hackaday.io! I’m also unable to load supplyframe.com, but I can load hackaday.com.